The world of hospitality officially welcomed Google Glass when the digital glasses were used to make a hotel booking through the new Hotel Near Me mobile travel app. Now the app’s creator, online travel agency Destinia.com, has released the free app to help the world’s tech-savvy frequent travelers browse and book their travel with the wearable device. The app can also take users on a stunning augmented reality virtual tour of each destination, while providing advertisers with enhanced traveler-targeting options. 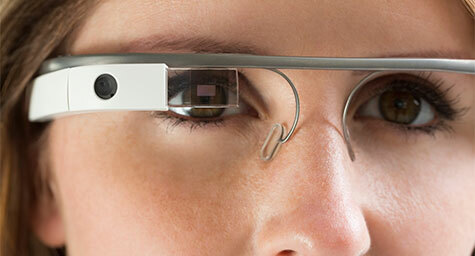 MobileCommerceDaily.com explored how Google Glass will upgrade mobile marketing and travel planning. The beauty of Google Glass is the way it lets travelers plan trips through an immensely immersive mobile viewing experience, yet escape the limits of smaller screens on most mobile devices. By using the Hotel Near Me app while wearing the glasses, high-tech travelers can research hospitality options with complete hands-free freedom, as opposed to having to hold and scroll through other mobile devices. The app delivers the most relevant and reliable hotel information by using the wearer’s GPS location data. Since Google provides the results, it has the ability to rank paid listings above organic results. This will expand mobile hotel marketing opportunities, as well as Google’s search business. In addition to its potential to greatly increase mobile advertising revenue, Google Glass provides a promising solution to the challenges of handheld mobile marketing. No matter how many mobile ads a marketer serves, there’s no guarantee that these ads will be seen if the device is not currently in the user’s hands. But when a user is wearing Google Glass, the experience is so all encompassing that it’s virtually impossible for users to miss a message because it’s flashed right before their eyes. This significantly increases both an ad’s exposure and the chance that the user will act on the ad. While Google Glass is still only the domain of early adopters and tech-forward fans, advertisers predict that the digital device will really boom later this year. That’s why so many marketers are taking this time to test out new apps and ad elements to ensure that they’ll be ready when Google Glass hits the mainstream. Hospitality marketing experts should follow their lead, especially since the travel industry has seen the enormous value of using interactive, experiential elements to promote properties. Google Glass can provide the added aspects of awe-inspiring augmented reality, targeted delivery, and hands-free ease to enhance their promotional power. Check in on what’s new in mobile hospitality marketing. Contact MDG Advertising today at 561-338-7797 or visit mdgadvertising.com. MDG Advertising, a full-service advertising agency with offices in Boca Raton and New York, NY, is one of Florida’s top hospitality marketing companies and branding firms. MDG’s core capabilities include advertising, branding, logo design, creative, infographic development, digital marketing, creative media planning and buying, radio and TV advertising, Web design and development, email marketing, mobile marketing, content marketing, social media marketing, and SEO. To stay on top of the latest trends in hospitality marketing and advertising, contact MDG Advertising today at 561-338-7797.